Living in the digital age, we understood that communication is changing. It was important for us that we "preserve" the traditional communication methods that we grew up with and cherish within our own families. And we knew we needed to share that with other families. This is how our simple, yet powerful concept of giving parents and children the opportunity to have fun together, share feelings and strengthen connections was born. Carmit Albeck - Mom of three, Retail Marketing Consultant, with BA in Economics and International Business Management, and a practitioner of alternative medicine therapies. Founded in 2008 by two moms, Shani Zukerman and Carmit Albeck, DreamBow started as a way to create special family moments. 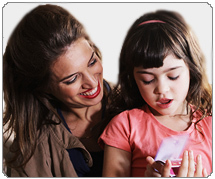 Our Mission is to create a foundation for positive communication between parents and children aroun the world. Since 2009, more than 300,000 DreamBow games are being played and loved as they connect families around the world. Translated into eight languages and counting, DreamBow games are gaining worldwide recognition and demand. Families in the United States and South Korea are the latest to experience DreamBow.